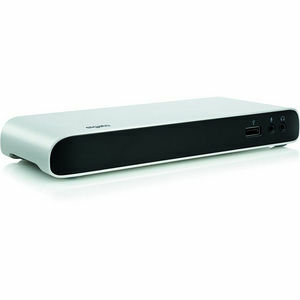 Elgato Thunderbolt™ 3 Dock enables you to connect everything to your MacBook Pro or Windows laptop at once. Use only one cable to charge your computer, drive dual displays, network at full speed and more - and harness the full potential of USB-C.
Providing up to 85 W of power, Elgato Thunderbolt 3 Dock charges your MacBook Pro through the same cable you use to connect it. Gone are the days of lugging around your power brick, or running out of juice if you forgot to pack it. Your USB devices will also benefit from superior power management: USB-C accessories are always properly powered with up to 15 W, while the built-in USB 3.0 ports can even charge your iPad, boost your iPhone charge, or power your Apple SuperDrive. And don't think twice if you need to shut down or head out - Elgato Thunderbolt 3 Dock will charge your devices regardless of whether your computer is off or disconnected. To enable high-power USB support on your Mac, simply download and install the free Elgato Thunderbolt Dock Utility. Elgato Thunderbolt 3 Dock offers two Thunderbolt 3 ports: one to connect and charge your computer, and one to extend the versatility of Thunderbolt even further. Connect cutting-edge accessories such as a 5K Thunderbolt 3 display, an ultra-fast storage solution, or an adapter for your legacy Thunderbolt 2 devices. And thanks to the versatility of USB-C, you can also opt to connect your USB accessories or an additional display to the same port - just as you would on your MacBook Pro or Windows laptop, minus the cable mess. Wired network connections are faster and more reliable than any Wi-Fi network, and with Elgato Thunderbolt 3 Dock, you can tap into the full performance of Gigabit Ethernet. Enjoy speedy connections to your servers, uninterrupted downloads from the internet and reliable file transfers with your co-workers - without an additional adapter dangling awkwardly from the side of your notebook. When it's time to leave, individually ejecting external drives can be a hassle. With the free Elgato Thunderbolt Dock Utility, avoiding data loss is just a click in your menu bar away: conveniently eject all storage devices at once and immediately see when it's safe to disconnect your Elgato Thunderbolt 3 Dock. Enjoy unplugging from work - quicker.